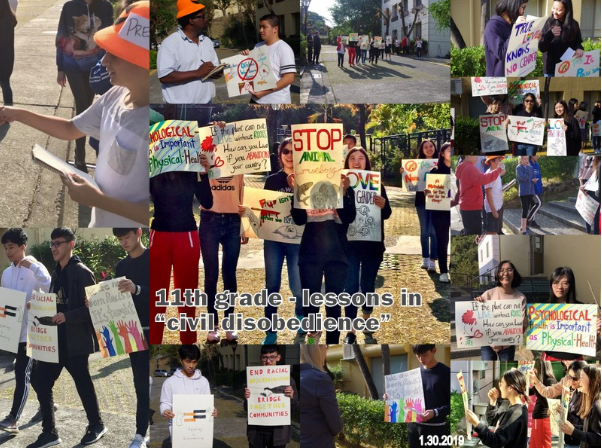 11th grade - lessons in “civil disobedience” / 高中部11年級英語課- "公民抗命"
This Wednesday our 11th grade English class ended our unit on transcendentalism with a mock protest. Henry David Thoreau is famous for his essay on Civil Disobedience and why it is important to stand up against unjust laws. Students chose an issue that they care about and created a poster to raise awareness about the issue. Then they prepared statements about the issue and facts to support their claims. They also made connections to Transcendentalism by citing quotes from Thoreau or Emerson that related to their stance on the issue. Kids created posters on issues such as windmill farms, motorbike safety, equality for all people, animal abuse and child abuse. One student promoted pride in one’s country and another student advocated for Mental health. The students marched down Lincoln Way and stopped in front of C building inviting bystanders to ask questions about their chosen issues. The press showed up, thanks to Jarvis Watson and Lorenzo Dombkowski. We also enjoyed our “sit-in” in the warm sun.